Garages are built with the purpose of having a place to park your car and store extra belongings in a safe and useable space. The problem is that most garages usually end up a cluttered mess, not leaving much room for anything else. By not utilizing the full potential of your garage and the extra space it provides, you’re missing out on major opportunities for organizing things like tools, car wash items, lawn equipment, grills and cabinets. 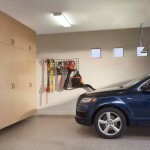 Don’t let your garage go to waste with our garage organizers in Illinois. What Is A Garage Organizer? With so many options for making room in your garage, Clabber Creek Closet Co. is sure to have the garage organization solutions that you need. Your garage is a huge benefit to your house and you should be using it to its full potential. At Clabber Creek Closet Co., we can take your garage from a messy, catch-all storage room into a clean and organized safe haven for your vehicles and belongings. You’d be surprised at how much extra space is hidden in your garage. Our garage organizers will help you pinpoint the areas of your garage that could serve as storage areas and then work with you to build those suggestions into a workable garage organization system. Wouldn’t you like to actually park the car in the garage? Get started today and call (815) 344-2772 for your FREE consultation.